We have provided a lot of information about portable basketball hoops on our site, which you can see here. 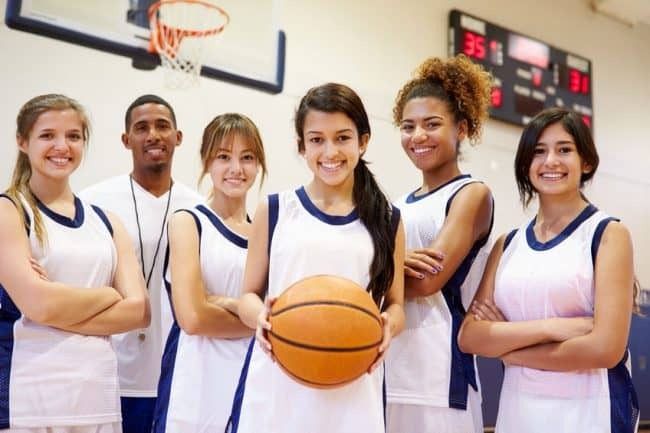 However, it has come to our attention that not everyone is looking for a portable basketball system and many are in the market for an in ground basketball hoop. In ground basketball hoops tend to be more durable and consistent in their play as they have a more solid foundation as the support pole is set in concrete. 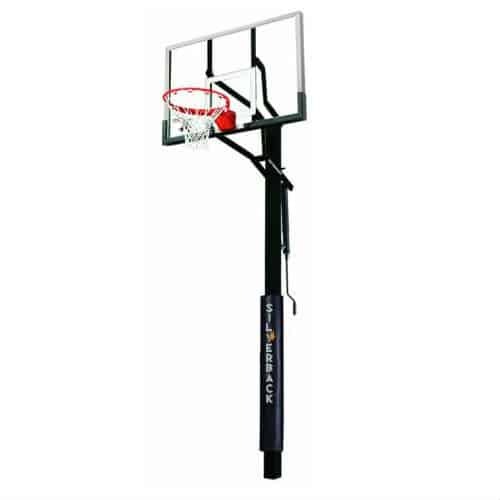 There is also more hoop options at the higher price points for in-ground basketball systems when compared to their portable counterparts. That is why we suggest you purchase an in ground basketball goal if any of the following describes you: you are likely to stay in your current residence for the foreseeable future, you or a family member is serious about the game of basketball and plans to spend many hours using the basketball system on a regular basis, you are planning to make a basketball court by laying concrete to get the “ultimate” home basketball experience. 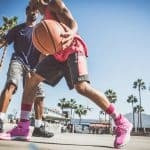 Our goal with this article is to list what we consider to be the absolute best in ground basketball hoops at three price points: Low-end, Middle-Tier, and High-end. Please feel free to look over our list and share it with any friends or family who may be looking to purchase an in ground basketball goal. Use our portable basketball hoops summary chart to fast track your way around this page to any hoop on our list that you are interested in. To jump to a hoop simply click on the basketball hoop name. ​The first choice on our list is the Lifetime 71281 In Ground Power Lift Basketball System. For the price this hoop has a lot to offer. 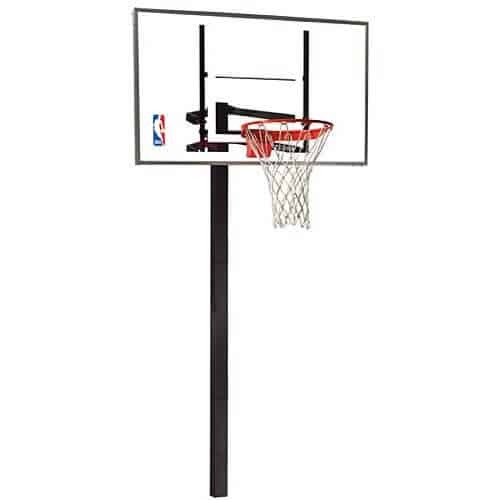 The frame and pole for this hoop are made of steel and it also features a nice pad that is attached to the bottom of the backboard for safety. The backboard is made 52 inches and made from poly-carbonate which is durable and works to minimize vibrations from shots. The rim is also a great value with double compression springs that will be able to sustain any high flying dunks. The hoop can easily be adjusted from 7-10ft. The Lifetime 71525 In-Ground Basketball Hoop is a nice hoop at a great price which is great for family games and developing your skills from the comfort of your home. This system provides consistent performance due to its rim that features two compression springs. The power-lift pole makes it so easy to adjust the hoop’s height that anyone can do it. The unit’s height adjusts anywhere from 7 and a half feet to the regulation 10 feet. For a value priced hoop the backboard is exceptional as it is made of Makrolon polycarbonate, which is significantly stronger than acrylic. As with the other Lifetime hoop in this category the 71525 also has the added feature of a padded backboard to keep any elite jumpers safe. 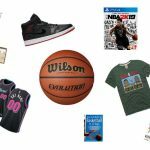 The Spalding In-Ground Basketball System makes our list because from our experience this hoop is great for anyone who wants to take their game to the next level without breaking their wallet. The backboard on this hoop is 60 by 34 inch and is made of tempered glass. Similar to most modern recreational hoops the Spalding In-Ground Basketball System can be adjusted in height from 7 and a half-10 feet. Spalding makes a great breakaway rim and this hoop shows their expertise. The rim is consistent, fair, and firm. There is an offset of two feet from pole to hoop so that you can work on your skills under the hoop. Because the hoop has a strong square steel support pole it will give you many great years of basketball performance. Check out the full review of this hoop here. Our first entry in the middle range portable basketball hoop class is a high quality system that comes with a 54 inch shatter-proof backboard. It is adjustable from 7.5 to 10 feet. The rim is better than those seen on the lower priced hoops and is durable, prepared to take on any dunkers with a Solid-steel Slam-It Rim with double-compression springs and welded net hooks. We wish the support system was a little more rigid at this price as it offers the same three piece, 3.5 inch diameter support pole as the one seen on the Lifetime 52 Inch system. However, there are two extra backboard braces which does give a marked improvement in terms of backboard vibrations in response to bank shots. Welcome to the top class of in ground basketball hoops. This is where the high flyers, ballers, and those with just a sweet shooting stroke play. Our first hoop for those that tickle the twine is the Lifetime Mammoth In-Ground Basketball System. While Lifetime is often known for being able to provide a good hoop at a great price, this hoop shows that when they want to make a great premium hoop they know what real players are looking for. 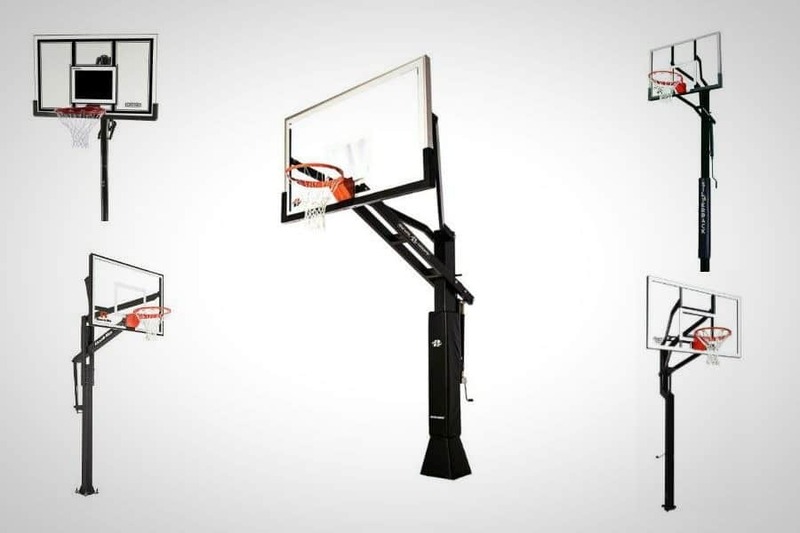 The Lifetime Mammoth In-Ground Basketball System comes in 54, 60, and 72 inch backboard versions. This goal can be adjusted from 7 and a half feet to 10 feet in infinite increments. The bolt down pole is 5×5 to 6×6 inches depending on which backboard size you purchase, and is made of powder coated steel. Because you can bolt down the pole to the cement it allows for easier leveling. We know that anyone with game would love to own this hoop. First Team is a smaller basketball hoop manufacturer that focuses on higher-end basketball systems. Their First Team Game Changer Hoop is a great choice in terms of a balance between quality and value. This hoop comes with a 60 inch backboard. This goal can be adjusted from 7 and a half feet to 10 feet in infinite increments. The single-piece bolt down support pole is 5×5 inches, minimizing hoop vibrations. Want a top end hoop without a ridiculous price tag? If so, we consider this one of the best. Ryval is not a basketball hoop brand that many are not familiar with, but with their line of premium in-ground systems this is likely to change. 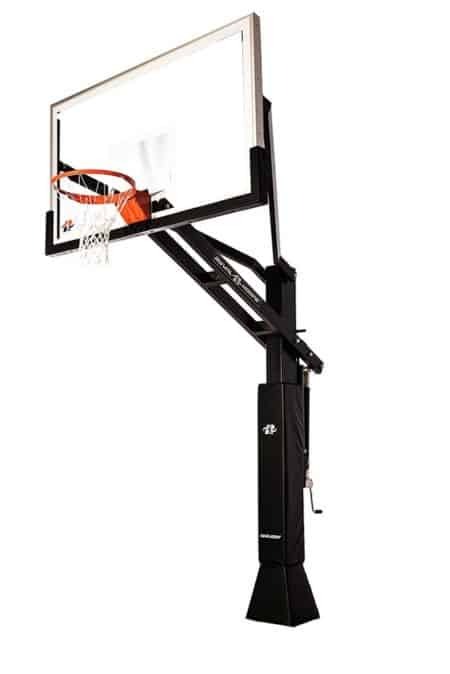 Their top of the line model is the C872, which made our list as one of the best in-ground basketball hoops. The Ryval C872 features a regulation size 72 inch tempered glass backboard that is a half inch thick. This backboard performs just like an arena quality hoop. When it comes to minimizing hoop vibrations the support pole is key. The support pole on the Ryval C872 is a one-piece system, which is the best you can get. This results in the hoop having minimal vibrations when the basketball hits the rim or backboard. 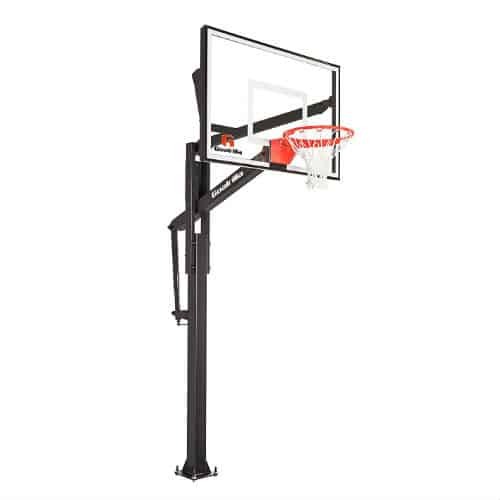 On top of these features, this basketball hoop also comes with rust guard and has a ridiculous height adjustment range of 5 to 10 feet! 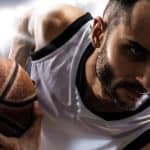 Goalsetter may not be the first name you think of when you consider basketball hoops, but the Goalsetter All-American In-Ground Basketball Hoop may change that. 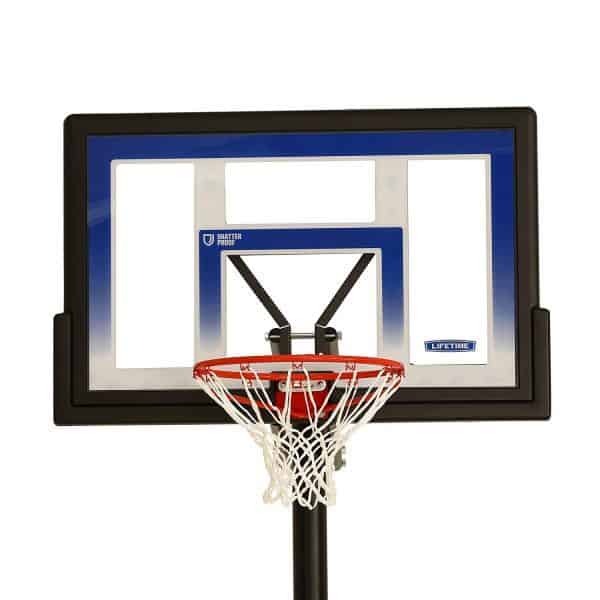 A 60 by 38 inch competition quality tempered glass backboard will make you think you are in the gym getting ready to take the last second shot. The support pole is a 5 inch square steel piece that can support monster dunks from the heaviest of rim shakers. The hoop can adjust in height an insane 6 ft. to 10 ft., making it the most versatile hoop on our list. Because of Goalsetter’s patented ground anchor hinge system the hoop can be fully assembled before being raised upright. 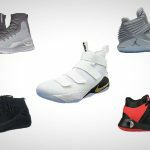 If you are ready to get serious about the game of basketball then it is time to seriously consider this hoop for your personal basketball heaven. Goalrilla is the big brother to the Silverback brand, and is the top brand for basketball hoops by Escalade. 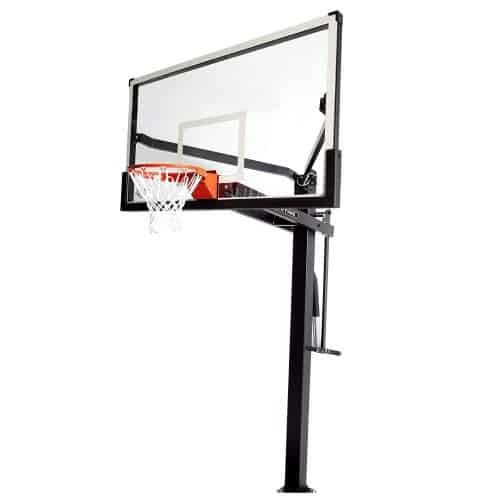 This FT In-Ground Basketball Hoop comes in three different tempered glass backboard sizes: 54 inches, 60 inches, and the regulation 72 inches. The backboard on this hoop performs as you’d expect from a gym quality hoop allowing for accurate bank shots. Rim stability is also good, as it has a good feel during shots and is durable enough to handle rim rocking dunks. 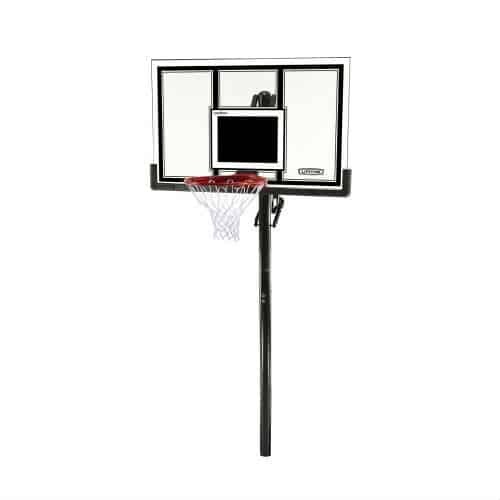 For our most spectacular hoop to have in your home we have chosen the Spalding Arena View In-Ground Basketball System. As we go through the features of this bad mamma jamma it should come as no surprise why it made our list. 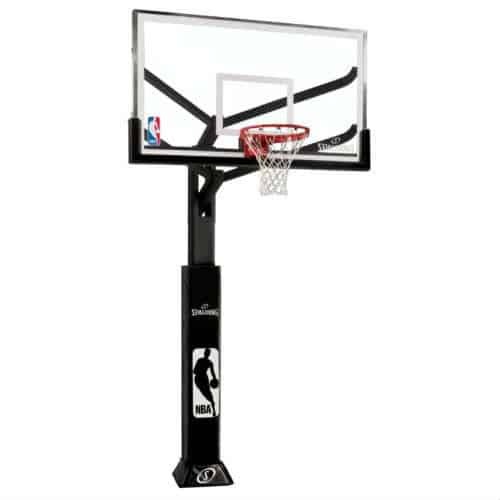 There are some options with this hoop as it comes in a 60 inch and 72 inch backboard versions. A half inch think piece of tempered glass makes up the backboard and its dimensions are 72 in. X 42in. The padding that aligns this hoop is similar to what you would find on a professional gymnasium hoop. Did we forget to mention that the hoop features the best rim on the list? How dare we! Well, let’s tell you now that this 180 degree breakaway rim plays just as you would expect: perfectly. So, what are you waiting for? If you plan to work on your game for hours on end and play endless pickup games into the night, then the Spalding Arena View is a must for you home. It’s no secret that skilled ballers have needs that differ from those of a youngster learning the game. 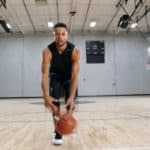 In general, more advanced players that put the game of basketball at a higher priority should plan to invest more into a top of the line in-ground basketball hoop. 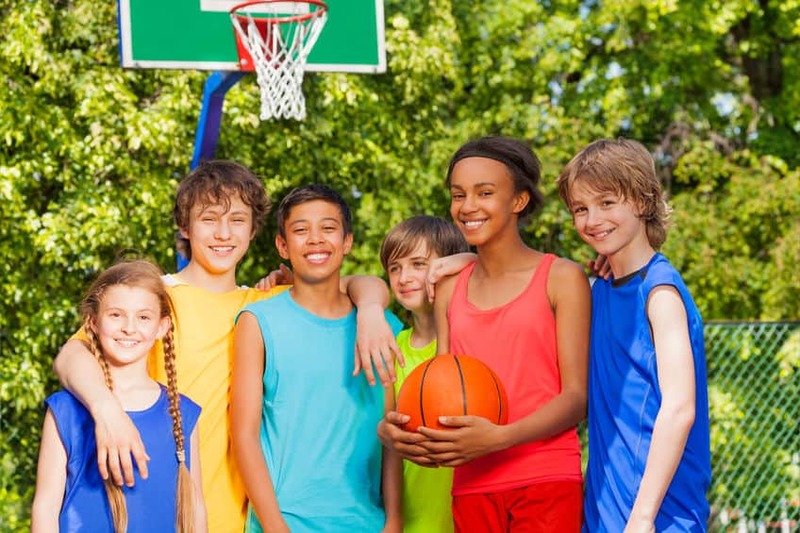 Intermediate players have expressed an interest in basketball and enjoy to play regularly. They may one day play at the high school or recreational level, but are not trying to be the next hoops star. There is no doubt their hoop will get used, but as a priority, basketball is not at the top of the list. Beginning players are just learning the basics of the game of basketball, or want to learn. They may or may not continue this interest beyond a year or two. This is also the category for families with small children who would like a hoop for some laid back family fun. There is no shame in admitting that you cannot afford the most expensive in-ground basketball hoop. 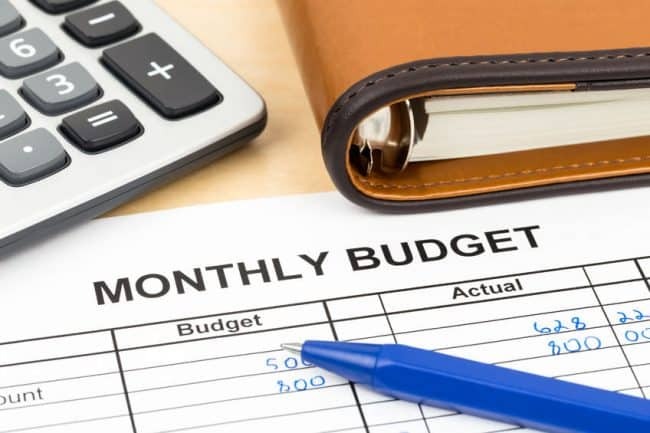 In fact, if you don’t have deep pockets it is better to admit than spend more than you are able. That said to get an in-ground basketball hoop that will perform up to most players’ expectations be prepared to spend at least $500. We’ve included several hoops in our low-cost category because they are certainly the best performing in-ground systems at their price point. But do not expect any of these hoops to perform with the likes of the Lifetime Mammoth or Goalrilla FT. 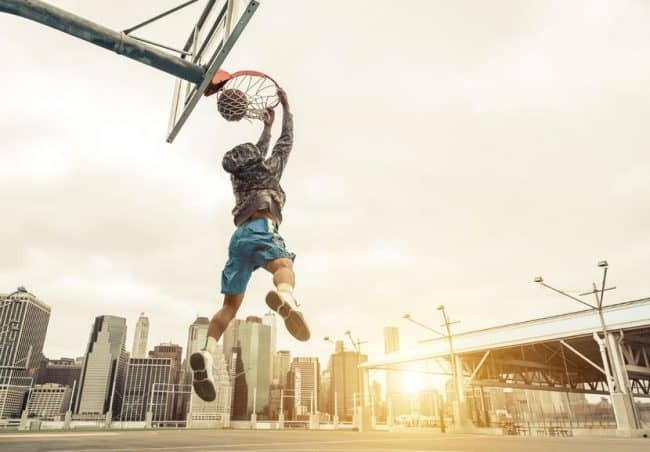 If money is your number one priority, it may be worth considering a portable basketball hoop, as many are cheaper than their in-ground counterparts. For those living in areas with Home Owners Associations (HOAs) or within city limits be sure to see if there are any regulations that may prevent you from having a basketball hoop that is visible. Most of these regulations will be named “Unsightly Nuisance” or something similar. Installing an in-ground basketball hoop is a big undertaking, and it we stink if you did all the work only to find out that having the hoop will get you a daily fine. With in-ground basketball hoops, installation is bound to involve some hole digging. Make sure to call 811 to ensure that there are no underground pipes or power lines underground. No hoop is worth taking a life threatening electric shock. And let’s be honest, nobody wants to be the guy who caused the power to go out in their neighborhood. NBA basketball courts are 94 feet by 50 feet. Unless you’ve spent a serious amount of dough to create an outdoor version of a full court sized playing surface, you will be most likely using your in-ground basketball hoop in a smaller space. When selecting a basketball hoop consider the space you have available. If you have a small space, it will make more sense to purchase a smaller basketball hoop that will take up less space. For those with wide driveways or dedicated court space be prepared to spend more on a hoop that has a larger backboard (60 inches or greater) with a thicker support pole. 1. How much time does it take to assemble a portable basketball hoop? This really depends on the model of in-ground basketball hoop that you've purchased. In general, cheaper units will take less time to assemble (~1-2 1/2 hours) while premium systems will take longer (~2 1/2-4 hours). If you are not adept in assembly, we recommend hiring a professional to complete the installation of premium in-ground hoops. 2. How many people do you recommend for the assembly process? As with time, cheaper in-ground basketball systems will take less manpower than more expensive units. For hoops under $400, two people can easily complete the assembly. More expensive systems will require three adults. This is mainly for setting the hoop upright, either into the cement base or the bolt-on system. 3. Where should I put my hoop? For lower-cost hoops a standard driveway should do the job. If you've spent big money on your in-ground hoop then we strongly recommend having a paved driveway or a cement court built on your property. 4. What height should I set the hoop for my child? 5. Which in-ground basketball hoops from the list are easiest to move? If you plan on moving often, I recommend purchasing a portable basketball hoop. For those who are set on an in-ground hoop, be sure to purchase a system with a bolt-on feature that will allow you to attach the support pole to the ground without submerging in cement. 6. Any tips on putting the support pole together? In my personal experience, this is one of the most difficult parts of the hoop assembly process. If you have difficult putting the support pole pieces together I recommend covering the pole with grease or WD40 to minimize friction. 7. How do I minimize hoop rust? Every year coat the most susceptible areas of the hoop with this corrosion inhibitor from WD-40. This includes any bolts, joints, and the rim. 8. Can I dunk on an in-ground basketball hoop? Dunking should be no problem on the high-end hoops listed in this article. Mid-range hoops will allow for light dunking (no hanging on the rim). Low cost in-ground hoops should not be used for dunking.